then the Final Kerma (c. 1580–1500 BC) C-Group Phase IIb–III. The Israelites who were Yemenite Arabs took refuge in Punt in 1876 BC. The people and rulers of Punt received them well for 430 years. During their refuge, many of those Israelites moved further into Kerma (ancient Nubia) and neighboring countries. Soon after their arrival the nomadic Israelites started looting, damaging, and enslaving the peoples of Punt, Kerma, and their neighbors, including the Beja people. But the rulers of Kerma and Punt in cooperation and support from the kings of Kamet (It was not yet called Egypt) started to protect themselves. King Ahmose I who ruled from 1549 BC until 1524 BC till King Thutmose III who ruled from 1479 BC until 1425 BC began liberating north Kemt from the Turkic Mongolian Hyksos in 1523 BC and chased them till the borders with Assyria. Then Kemt went further and assisted Kerma and Punt to kick out the Israelites and expelled them from their lands and push them back to Yemen by force in 1446 BC. Unfortunately, the eastern coast of Punt, particularly the land of the Beja, fell again under raids since 1200 BC but this time from Turkic Mongolians coming from the Arabian Peninsula after they devastated it. Around 1000 BC the Turkic Mongolian raiders established themselves in Southern Arabia and created in 800 BC the Sabaean chieftaincy pretending to be Sheba of Punt. In the eastern coast of Punt they created a Turkic Mongolian colony calling it D’mt (c. 980 BC–c. 400 BC). The Sabaeans and D’mt worked together and in c 785 BC a third kingdom was created in what used to be Kerma. The new sister kingdom was called Kush. With these three kingdoms Turkic Mongolian devastation, looting and slavery continued in Arabia, Punt, and Karma. This resulted in the final fall of civilizations of Punt and Karma. 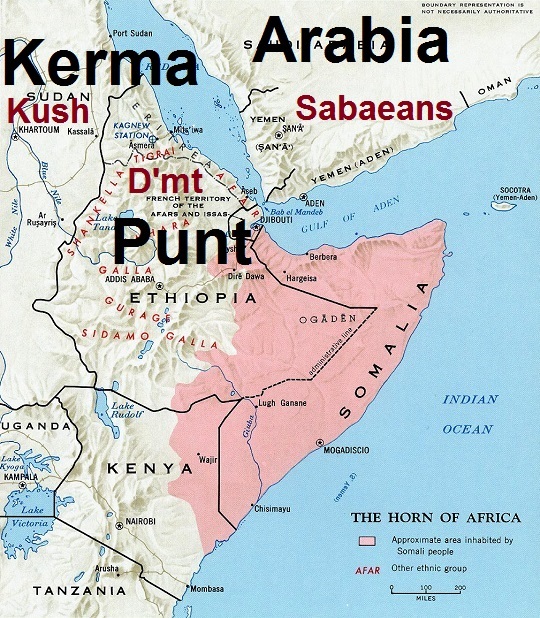 Kush indeed was degeneration and vulgarization of the Kerma civilization that was one of the greatest and oldest African and human achievements. The fall of the Beja to Turkic Mongolians had grave repercussions led to the loss of independence, freedom, and development in Punt and Kerma. The Turkic Mongolian groups who devastated all the Middle East, India, Europe, and Africa are originally from Western Mongolia, East Kazakhstan Region and the Uyghurs of Xinjiang in China. They are of Mongolian and Turkic speaking groups from the Altaic Family. How did you get that saba were turkic mongolians ? Were you threatened to change things . At first I became sure that the Israelite never went to Egypt. I assumed they were Arabs from Yemen. I researched the Turkic Mongolian invasions and how they turned Iran to Persia. The history of single-hump camel (The dromedary) blow up my Yemeni hypothesis and took me to Punt. I realized the Punt hypothesis is correct and the original Saba was in Punt. Linking the the history of Turkic Mongolian invasions and the history of Arabs and their grouping it became very obvious to me that Yemeni Saba was forged version on the original Saba of Punt. Minerals, animals, language, rulers list, and Jewish history versus Israelite history made it clear that Saba of Yemen was Turkic Mongolian colony.